This photo sums up the Cavs series nicely, I think. Tim Duncan stuffing the ball back in LeBron James’ face in Game 1. That’s when you had the first inkling that it would be a sweep. I do want to add, however, that I am not a LeBron basher. I went into this series kind of down on LeBron because I thought he was too arrogant, cocky and immature. But after seeing how he handled himself throughout the series, my respect for him has gone up. I think he definitely has what it takes to be a super-duper-star in the NBA. I’m very happy that the Spurs swept the series. I didn’t want it to go to a Game 5. And we have Manu Ginobili to thank for that. In the fourth quarter last night it turned into the Manu show - with some support from Duncan, naturally. But without Manu’s effort at the end I think the Cavs might have slipped the noose and forced another game. Besides hitting all of his free throws, which were crucial, Manu made two exceptional drives to the basket and hit a big 3-pointer. But the play I liked the best was an assist. 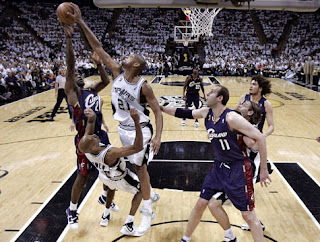 Manu had the ball at the top of the key, beyond the 3-point line when he suddenly gave a head fake and then fired a bullet pass right through the heart of the Cavs defense to Fabricio Oberto who had just inched away from his defender and was standing under the basket. Oberto made the easy basket and drew a foul for a 3-point play. Brilliant! Tony Parker was of course great through the first three quarters and richly deserved his MVP trophy while Tim was just happy to get ring No. 4. Are they a Dynasty? Damn straight! The Spurs are the most successful sports franchise of the past decade. The core of their team is locked up - assuming Duncan re-ups in ‘08 - through at least 2010. I can’t see the Spurs making any major adjustments over the off season. Duncan, Parker and Ginobili are all superstars. Bruce Bowen is hands-down the best defender in the NBA. Oberto has stepped up to be a valuable addition as a center who fits well with the rest of the team - he practically has a mindmeld going with Manu. Robert Horry says he wants to play one more year and get his 8th championship ring. Michael Finley has some more good years in him and Brent Barry rounds out one of the best benches in the league with a roster full of 3-point aces. Even Francisco Elson and Jaques Vaughn have held their own as subs who can step in to give the stars a break. The only player on the team who seems to be expendable at this point is probably Beno Udrih. I think the Spurs will be back next year whether the national media likes it or not. And this business of not giving the Spurs the R-E-S-P-E-C-T that they deserve is starting to make them look rather silly.